There’s some great news here at AGD. Thanks to a referral, I have recently signed a new client. I won’t be posting any photos of her as she’s not on Twitter and doesn’t have a blog. My client’s main goals are to update her work wardrobe and to buy several pieces for upcoming events. The challenge will be to find clothes that are stylish, yet appropriate for a conservative work environment. I believe American women in their 50’s, and up, can look current without trying to dress as if they are still in their 20’s. The other extreme isn’t great either. We will be focusing on stylish classics that can go from work to dinner. My client looks great in black, white, and red. She also wants to add more color to her wardrobe. The DVF dress below would be perfect for my client. She’s petite with a runner’s frame. A change of accessories could easily take this dress from the workplace to drinks and/or dinner. I’ve pulled other images for inspiration. That board is HERE. 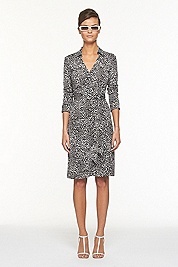 A classic wrap dress from DVF. this is awesome, great news!! you go girl. that’s just awesome.